There's nothing I enjoy more than studying the Bible. Yet it has not always been that way. My real passion for studying Scripture began when as a college student, I made a commitment to explore the Bible in earnest. I found that the more I studied, the more my hunger for Scripture grew. Here are three simple guidelines that have helped me to make the most of my study time. First, I begin with reading the Bible. That seems obvious, but quite frankly, it's where many people fail. Too many Christians are content with a second-hand knowledge of Scripture. They read books about the Bible instead of studying the Bible for themselves. Books are good, but collateral reading can never replace the Bible itself. There are many good Bible reading plans available, but here is one I've found most helpful. I read through the Old Testament at least once a year. As I read, I note in the margins any truths I particularly want to remember, and I write down separately anything I don't immediately understand. Often I find that as I read, my questions are answered by the text itself. The questions to which I can't find answers become the starting points for more in-depth study using commentaries or other reference tools. I follow a different plan for reading the New Testament. I read one book at a time repetitiously for a month or more. I began doing this when I was in seminary, because I wanted to retain what was in the New Testament and not always have to depend on a concordance to find things. If you want to try this, begin with a short book, such as 1 John, and read it through in one sitting every day for 30 days. At the end of that time, you will know what's in that book. Write out on index cards the major theme of each chapter. By referring to the cards as you do your daily reading, you'll begin to remember the content of each chapter. In fact, you'll develop a visual perception of the book in your mind. Divide longer books into short sections and read each section daily for thirty days. For example, the gospel of John contains 21 chapters. Divide it into 3 sections of 7 chapters. At the end of 90 days, you'll finish John. For variety, alternate short and long books and in less than 3 years you will have finished the entire New Testament--and you'll really know it! As I read Scripture, I always keep in mind one simple question: "What does this mean?" It's not enough to read the text and jump directly to the application; we must first determine what it means, otherwise the application may be incorrect. Gaps to Bridge The first step in interpreting the Bible is to recognize the four gaps we have to bridge: language, culture, geography, and history. 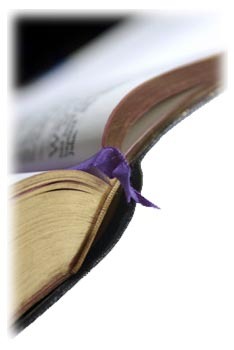 LanguageThe Bible was originally written in Greek, Hebrew, and Aramaic. Often, understanding the meaning of a word or phrase in the original language can be the key to correctly interpreting a passage of Scripture. Two books that will help you close the language gap are An Expository Dictionary of New Testament Words, by W. E. Vine, andNelson's Expository Dictionary of the Old Testament, by Merrill F. Unger and William White, Jr. You don't need to know Greek or Hebrew to use those books effectively. CultureThe culture gap can be tricky. Some people try to use cultural differences to explain away the more difficult biblical commands. Don't fall into that trap, but realize that we must first view Scripture in the context of the culture in which it was written. Without an understanding of first-century Jewish culture, it is difficult to understand the gospels. Acts and the epistles must be read in light of the Greek and Roman cultures. The following books will help you understand the cultural background of the Bible: The Life and Times of Jesus the Messiah, by Alfred Edersheim, Sketches of Jewish Social Life, also by Edersheim, and The New Manners and Customs of Bible Times, by Ralph Gower. GeographyA third gap that needs to be closed is the geography gap. Biblical geography makes the Bible come alive. A good Bible atlas is an invaluable reference tool that can help you comprehend the geography of the Holy Land. Of course, nothing helps like seeing the land first-hand on a tour. HistoryWe must also bridge the history gap. Unlike the Scriptures of most other world religions, the Bible contains the records of actual historical persons and events. An understanding of Bible history will help us place the people and events in it in their proper historical perspective. A good Bible dictionary or Bible encyclopedia is useful here, as are basic historical studies. Principles to Understand Four principles should guide us as we interpret the Bible: literal, historical, grammatical, and synthesis. The Literal PrincipleScripture should be understood in its literal, normal, and natural sense. While the Bible does contain figures of speech and symbols, they were intended to convey literal truth. In general, however, the Bible speaks in literal terms, and we must allow it to speak for itself. The Historical PrincipleThis means that we interpret Scripture in its historical context. We must ask what the text meant to the people to whom it was first written. In this way we can develop a proper contextual understanding of the original intent of Scripture. The Grammatical PrincipleThis requires that we understand the basic grammatical structure of each sentence in the original language. To whom do the pronouns refer? What is the tense of the main verb? You'll find that when you ask some simple questions like those, the meaning of the text immediately becomes clearer. The Synthesis PrincipleThis is what the Reformers called the analogia scriptura. It means that the Bible doesn't contradict itself. If we arrive at an interpretation of a passage that contradicts a truth taught elsewhere in the Scriptures, our interpretation cannot be correct. Scripture must be compared with Scripture to discover its full meaning. Having read and interpreted the Bible, you should have a basic understanding of what the Bible says, and what it means by what it says. But my Bible study doesn't stop there. I never study God's Word just to get a sermon. My ultimate goal is to let it speak to me and enable me to grow spiritually. That requires personal application. Bible study is not complete until we ask ourselves, "What does it mean for my life and how can I practically apply it?" We must take the knowledge we've gained from our reading and interpretation and draw out the practical principles that apply to our personal lives. If there is a command to be obeyed, we obey it. If there is a promise to be embraced, we claim it. If there is a warning to be followed, we heed it. 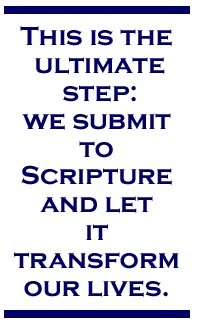 This is the ultimate step: we submit to Scripture and let it transform our lives. If you skip this step, you will never enjoy your Bible study and the Bible will never change your life. Bible study is not optional in the Christian life. It is both the obligation and the privilege of all believers. If you are not involved in regular, systematic Bible study, you are missing one of the primary means God uses to bring us to maturity (1 Peter 2:2). What's wrong with the "what does this verse mean to me" approach to interpreting the Bible?